Case of 6 tubes EnviroGuard Acid Resistant Sealant, fast curing, high adhesive strength, primerless application. Case of 12 tubes EnviroGuard Acid Resistant Sealant, fast curing, high adhesive strength, primerless application. Case of 24 tubes EnviroGuard Acid Resistant Sealant, fast curing, high adhesive strength, primerless application. Part Number: BATTCRT20 Battery Watering Cart 20 Gallon, Polypropylene Tank, 110 vac operation with gun included. Part Number: BATCRT10-12V 10 Gallon, 12 Volt, Battery watering cart for lead-acid applications with gun included. Case of 12 quart size spray bottles, Acid Neutralizer Spray. 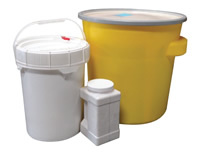 Transforms hazardous acids into safe, disposable organic salts.